A set of yearlings strutting across a grassy field in pairs, as dripping strands of Spanish moss hang over their heads. 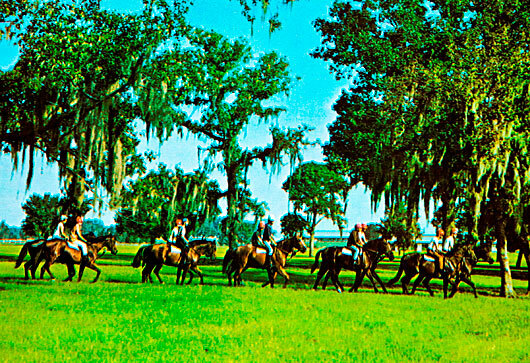 It is the summer of 1965 and Ocala, Fla. is alive with a new crop of Thoroughbreds. The area, rich in limestone, is still in its fledgling stages that year as an alternative to the Kentucky bluegrass. In 1943, Carl Rose, seeing the potential in the area, bought up acreage along State Highway 200 at $10 per acre, which he developed into Rosemere Farm. When his colt, Gornil, won a race at Tropical Park, he became the first Florida-raised Thoroughbred to win a race in the Sunshine State. In 1956, Needles won the Kentucky Derby, becoming the first Florida-bred to capture the Run for the Roses. While Ocala was growing in stature, with new breeding establishments popping up, it still had not produced a horse considered one of the all-time greats. That is why no one could have foreseen that the group of yearlings pictured above at Tartan Farms would help change the face, not only of the Florida breeding industry, but the Thoroughbred industry as a whole. It was only appropriate that the two yearlings who would go on to leave an indelible mark on racing and breeding were the two leading the group. On the right, in the foreground, is an Intentionally colt later to be named In Reality. To his left, and, of course, in front, is a Rough ‘n Tumble colt later to be named Dr. Fager. Directly behind them are Ruffled Feathers, who would win the Man o’War Stakes, and Minnesota Mac, a stakes winner who would go on to sire grass champion MacDiarmida. Bred to the great Tartan Hall of Famer Ta Wee, he would sire multiple stakes winner Great Above, who in turn would sire Horse of the Year and Hall of Famer Holy Bull, whose son Giacomo captured the Kentucky Derby. From this group of yearlings, born mainly from the genius of John Nerud, came the founding fathers of the Florida breeding industry. The only one not officially bred by Nerud and Tartan Farms (owned by William McKnight) was In Reality, who for the next three years would continue to try to get his head in front of Dr. Fager. The only time he managed it was when he launched a desperate sneak attack in the 1967 New Hampshire Sweepstakes, coming up on Dr. Fager’s inside down the backstretch trying to catch the tiger by surprise. But as soon as he stuck his head in front, his boyhood pal retaliated by attempting to savage him. Dr. Fager, of course, turned back that challenge, as he did so many others, and went on to win by 1 1/4 lengths, as both colts shattered the mile and a quarter track record, with the Good Doctor stopping the teletimer at 1:59 4/5. Although In Reality was bred by Mrs. Frances Genter, he was raised at Tartan and his sire, Intentionally, was a Tartan foundation sire who Nerud had purchased privately as a racehorse for a then decadent $750,000. In Reality, unlike the tall, powerful, and wild-looking Dr. Fager, was a feisty little bulldog of a horse and equally tenacious. While Dr. Fager would look you in the eye with those daggers and break your heart, In Reality was like a terrier that grabs hold of your pant leg and doesn’t let go. Unfortunately for In Reality, he not only came along in the same year as Dr. Fager, but also Horse of the Year and Hall of Famer Damascus. Unlike his two arch rivals, Damascus had the ability to pounce on his prey with a spectacular cat-like move and leave them for dead far up the track. His explosive power was unlike anything seen for decades. But to his credit, In Reality for the most part held his own against both these legends, and asserted his authority whenever he wasn’t facing them. In his first six career starts at 2, he won four, with two seconds. In his only two defeats, he was beaten a nose by the lightning-fast Great Power in the Sapling Stakes and only three-quarters of a length by Dr. Fager in the Cowdin Stakes, a race in which he made The Doctor, coming off three victories by a total of 27 lengths, run hard for the first time in his life, as Bill Shoemaker admittedly gave Dr. Fager a poor ride, resulting in the colt banging up his knee pretty good. Stretching out to two turns for the first time, In Reality defeated eventual 2-year-old champion Successor by a half-length in the Pimlico-Laurel Futurity. He was unable to handle the slop at Garden State in his next start, the rich Garden State Stakes, and could only finish fourth behind Successor. With Dr. Fager getting a late start at 3 and Damascus taking the New York route to Louisville, In Reality had a field day in Florida, winning the Hibiscus Stakes, Fountain of Youth Stakes, and Florida Derby, and finishing second in the Flamingo Stakes and Florida Breeders’ Handicap. In the latter, he was forced to carry 130 pounds and give 13 pounds to Biller, who beat him three-quarters of a length. 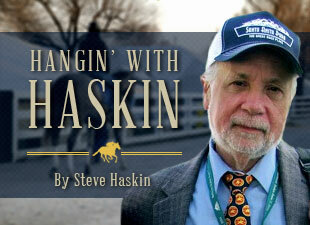 In Reality skipped the Kentucky Derby and was pointed to the Preakness by trainer Melvin “Sunshine” Calvert. He was primed and ready for a top effort, and although he ran a tremendous race, he couldn’t withstand the powerhouse move by Damascus, who beat him 2 1/4 lengths, with Kentucky Derby winner Proud Clarion another four lengths back in third. What was most encouraging was the fact that In Reality, after Damascus blew by him and opened up a 3 1/2 -length lead at the eighth pole, actually came creeping back in the final eighth to finish 1 1/4 lengths closer at the wire. It was now time to take on Dr. Fager once again, this time in the Jersey Derby at Garden State Park. The Doc had won both his starts in ’67, beating Damascus in a titanic stretch battle in the Gotham Stakes and then demolishing the speedy Tumiga in the one-mile Withers, winning by six lengths in 1:33 4/5, the fastest mile ever run by a 3-year-old in New York. What followed was one of the most controversial races ever; one that is still talked about today by those who saw it. Nerud was a bit apprehensive running at Garden State, because as Nerud put it, the chief steward, Keene Daingerfield, didn’t like Nerud and hated (Dr. Fager’s jockey) Manny Ycaza. Daingerfield was one of the stewards who disqualified Ycaza (known for his aggressive riding) from first in the Flamingo Stakes in 1957, putting up Calumet’s Tim Tam and costing Ycaza his first $100,000 victory. Nerud knew, by having Ycaza aboard Dr. Fager, he was sitting on a potential powder keg. That little pep talk gave the race the last thing it needed – bad karma, especially with Ycaza waking up that morning with a premonition something bad was going to happen. But all Ycaza had to do from the outside post was to gun Dr. Fager to the lead, which he would be able to do easily, clear the field, and let him roll from there, running the others off their feet. Ycaza had heard Sunshine Calvert give jockey Earlie Fires instructions to go to the lead and felt like he could sit right behind In Reality. But Nerud wanted no part of that. So, Ycaza gunned Dr. Fager to the lead, and what happened after that will forever be a major subject of controversy. As Ycaza cut over entering the clubhouse turn, a traffic jam ensued inside him. First Air Rights and Gallant Moment bumped twice. Then In Reality, just inside Dr. Fager, was forced to steady and came in on both of those horses at the seven-eighths pole. For a four-horse field, it was an ugly mess. Dr. Fager went about his business, and as expected, ran the other three into the ground. After three-quarters in a sprightly 1:10 3/5, The Doc kept increasing his lead, winning eased up by 6 1/2 lengths in 1:48 for the nine furlongs, three-fifths off the track record. In Reality was eight lengths ahead of Air Rights, with Gallant Moment another 12 lengths back in fourth. The stewards inquiry sign went up immediately, and it took only a few minutes before Dr. Fager’s number came down, placing him last. Ycaza was shocked, citing Daingerfield’s feelings toward him, calling the disqualification “outrageous.” Both he and Nerud claimed Dr. Fager was well clear of the others and no contact was ever made. But the bottom line was, In Reality had beaten his nemesis for what would be the only time in his career. He bounced out of that race to win the Rumson Handicap and Choice Stakes at Monmouth Park. Calvert began to contemplate taking on Damascus again in the American Derby at Arlington Park, but felt Damascus was too strong, and it would make no sense to embark on such a fruitless venture. Well, six pounds or no six pounds, this wasn’t the time, as Damascus put in his patented explosion of a move on the far turn and blew the doors off In Reality, winning by seven lengths in a track-record 1:46 4/5. A month later, came the New Hampshire Sweepstakes and the savaging incident, as if Dr. Fager was still upset over getting beat by In Reality by a disqualification. In Reality made only one more start in 1967, dropping a half-length decision to High Tribute in the one-mile Jerome Handicap, giving 13 pounds to the winner. In the winter of 1968, In Reality returned to Florida, where he had been so successful the year before. But three starts resulted in a second and two thirds. When he was sent up North, he responded by rounding into the best form of his career. He started off by setting a track record at Bowie, winning an allowance race over Barbs Delight before defeating that rival again in the John B. Campbell Handicap. Sent to New York for the seven-furlong Carter Handicap at the newly opened Belmont Park, he defeated the swift Tumiga and Mr. Washington by 1 1/2 lengths in 1:21 4/5. That put him on a collision course with Dr. Fager in the one-mile Metropolitan Handicap, first leg of the Handicap Triple Crown. The Doc had journeyed to California to win the Californian Stakes, but when he returned, he came down with a severe case of colic that nearly killed him and forced him to miss the Met Mile. With Dr. Fager out of the race, In Reality had no trouble defeating Advocator, in receipt of seven pounds, by 1 1/2 lengths in 1:35 flat. Dr. Fager recovered fully from his ordeal, while Damascus, who was now the reigning Horse of the Year, had come off a bit of layoff after a California campaign to easily win an allowance race at Delaware Park in near track-record time. Finally, all three horses were heading for the same race, the Suburban Handicap, second leg of the Handicap Triple Crown. It was to be a race for the ages, much the way the previous year’s Woodward Stakes was when Damascus, Dr. Fager, and Buckpasser clashed. It was apparent that when Whiteley scratched Damascus’ rabbit, Hedevar, the morning of the race, there would be no speed to challenge Dr. Fager, and a loose-on-the-lead Dr. Fager was unbeatable. It looked as if In Reality would have to be the sacrificial lamb, but he stumbled coming out of the gate and never got close to the lead, finishing a distant last of five and suffering a career-ending injury. Dr. Fager and Damascus, who was now the sacrificial lamb, would stage an epic battle in the Suburban, with Dr. Fager equaling the track record. Damascus, with the aid of Hedevar and five pounds, would get his revenge in the Brooklyn Handicap, breaking Dr. Fager’s short-lived record. Two track records, 16 days apart, with Dr. Fager carrying 132 and 135 pounds and Damascus carrying 133 and 130 pounds. It was pretty obvious that In Reality, as good a horse as he was, was not quite in the same league as his two legendary rivals. Dr. Fager died at age 12 of a ruptured stomach, and a year later was the leading sire in America. He would become a major influence on the breed, especially through his grandson Fappiano. In Reality also would become a dominant force in the breeding industry, his name appearing in the pedigree of six Kentucky Derby winners – Orb, Unbridled. Smarty Jones, Mine That Bird, Real Quiet, and Grindstone. Other descendents of In Reality include two-time Breeders’ Cup Classic winner Tiznow; Preakness, Belmont, and Travers winner Point Given; Belmont and Travers winner Birdstone; Belmont winner Empire Maker; Breeders’ Cup Classic and Met Mile winner Ghostzapper; and Preakness winner Oxbow, just to name a few. Two yearlings walking across a field side by side on a summer morning had changed the face of breeding in Florida and provided racing fans with some of the greatest moments of the turbulent ‘60s, their names forever etched in racing and breeding lore. Filed under: Dr. Fager, john nerud, Tartan Farms, Needles, Carl Rose, Ocala, In Reality, Rosemere Farm, Fla.